How many of us have stayed home rather than face the potential ordeal of your autistic child having a melt-down at an unfamiliar place or event? How do you get over this? One family came up with a novel idea to get them out of the house. Mum, Melanie Reid, has written to tell us all about it and how they learned a few things about their son in the process too. My son is a wonderful little human being. He's intelligent, determined and has a very dry sense of humour. He regularly impresses me with the number of facts he knows about the world around him and he makes me laugh. He is also on the autistic spectrum. This means that sometimes people "see" a very different little human being than I do. His intelligence can present itself as domineering, his determination as bossiness and his sense of humour as rude and inappropriate. Whilst he knows many facts about the world, he has a very different understanding of how the world does and should work in comparison to many other people. My son also suffers from anxiety and every day is a challenge for him. He likes routine and to know what is coming next. This makes experiencing new things, meeting new people and visiting new places something that our family now only enters into with trepidation. Is doing something new worth the risk of triggering a full-blown meltdown? More often than not it seems we have been deciding it is not worth it, in fact we have become quite isolated. We now subconsciously (actually it is very consciously!) do damage limitation assessments before we even set foot out of the house, and as a result we've been staying home a LOT. We decided to do a little experiment. Could we turn what were now mutual family fears of the unknown into something fun? So, we invented a game called the Magical Mystery Tour. The idea was to take a risk and push all of our boundaries to see if we could make the unknown an adventure, rather than a full blown anxiety driven meltdown. The game was simple; a mix of directions, fun things to do and a few challenges all cut up and put in a bag! We’d then take turns to pull them out the bag and see where we ended up. The real challenge was of course trying to convince our son to turn off his Xbox, get dressed and get in the car, although I have to say it was easier than I thought (as he was intrigued about why we would suggest such a "stupid" idea and the idea of an ice cream was clearly quite appealing!). Without thinking, we set off on our game during Goodwood’s Festival of Speed. Anyone who has ever been anywhere near West Sussex during those four days knows that traffic and gridlocks can be an issue and the thought is an anxiety-raiser for most local people. The thought of us being “magically” directed towards Goodwood each time an instruction was pulled out of the bag really helped us get in to our son’s headspace! Yes, it was frustrating to start with, we didn't quite think the rules through properly and as a result we spent the first 20 minutes burning petrol driving round the housing estates of Tangmere (which if you don’t know is incredibly close to Goodwood!). It took our son those 20 minutes to stop being agitated and disgruntled. We tried desperately not to be agitated and disgruntled ourselves, as it looked like the “magic” was definitely out to send us to the traffic jam from hell. It was beginning to look like our son was right, this was a very “stupid” game indeed. Suddenly, it all turned around when he grabbed the bag of directions himself. This gave him some control over what was going to happen next and “magically” directed us to the shores of tranquil Bosham, where there was barely a car in sight…and they have great ice cream! Yes, some bits were more enjoyable than others and some we would skip next time. For example, a packet of Jelly Babies would've been far more pleasant than the sweets he chose called "Toxic Waste" that literally brought tears to our eyes! BUT, once we got going we enjoyed the ride, ended up in places we hadn't been to for ages, and enjoyed places we didn't even know existed. Even our expectations of the Goodwood traffic turned out to be unfounded. It taught us all a lesson: It isn't just people on the spectrum who like routine and have a fear of the unknown. We realised that we all like to have a degree of control over what we do and what is going to happen to us. We also like to know there's going to be a positive outcome. Most of us experience anxiety in some form when faced with the unexpected, but perhaps we can teach ourselves not to always be fearful of the unknown? 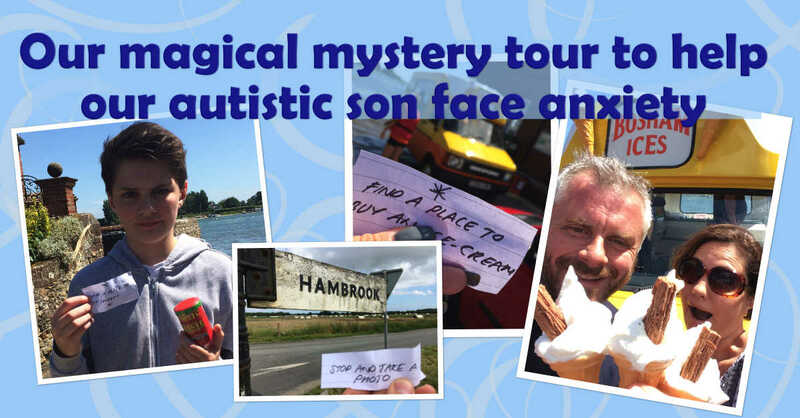 I hope that our story may reach people who do not understand the challenges faced every day by people on the spectrum. My mum said that the idea helped her put herself in our son’s headspace, so maybe this could help people who don't understand the challenges faced by ASD people to understand in just a small way what it's like. If one less child experiencing anxiety is judged for behaving 'inappropriately' and instead treated with a little more compassion and understanding, that would be a brilliant thing.